Tell your customers about a new feature or send a group of users a targeted promotion. Whatever your use case, Broadcasts are a way for you to send message through Assistant to multiple people at once. Note: Broadcast messages will form part of your chat history with a user and will be visible in the message feed when you have a conversation with them. Combine as many filters as you like to build a list of users that you want to send a broadcast message to. You can also just select a Smart Group that you've previously saved. Broadcasts are a one off message that are sent to the people who currently match your filter. 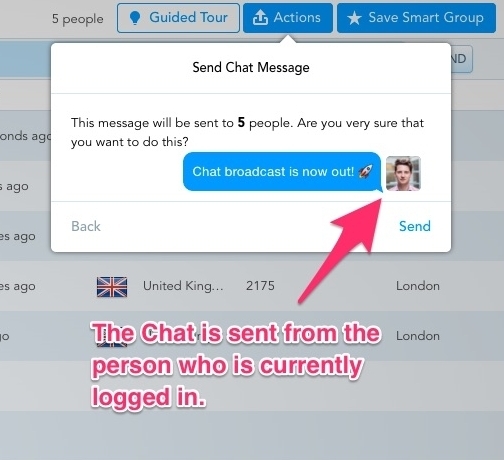 People that enter the Smart Group in the future will not be sent the Broadcast unless you manually re-send the message again. Once you're happy with your list of users, hit the 'Actions' button in the top right of the screen. Then select the 'Send a broadcast option'. You can include emoji and links in the message too. You'll get a chance to preview how your message looks before you hit send. Broadcast messages will be sent from the agent/team member that composes them. The message will be sent immediately. Note: If the recipient is not currently online, they will receive they will automatically receive the message next time they come online. You can view a history of your team's broadcasts from the broadcasts tab. It shows you who sent the broadcast, the message contents, and how many people received it.